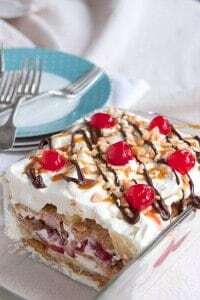 This Banana Split Icebox Cake is a summer favorite. Layers of your favorite banana split flavors in an easy, no-bake dessert make it perfect for cookouts and celebrations. You know about “icebox cakes,” right? Old-fashioned, no bake desserts that have been around for decades. They’re layers and layers of crispy cookies with either pudding or whipped cream and sometimes fruit. You layer it all up, put it in the “icebox” overnight and the crispy cookies turn into moist cake-like layers. Yum. One of the most popular posts I’ve ever published on Never Enough Thyme is my Strawberry Icebox Cake. And no wonder! What’s not to like about strawberries, whipped cream, and chocolate? So, I was thinking about that recipe a few days ago and whether I could do something a little different with it when the thought of a banana split popped into my head with this recipe following immediately behind. It’s very similar but instead of all strawberries, it also has layers of banana and pineapple and is finished with chopped salted peanuts, maraschino cherries (of course! what’s a banana split without a cherry on top? ), and both chocolate and caramel ice cream toppings. 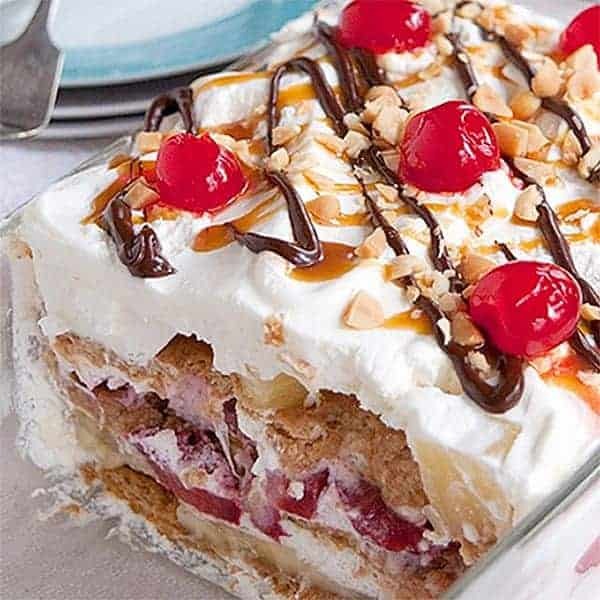 Hope you enjoy this easy, no bake Banana Split Icebox Cake as much as we do. It’s a winner! 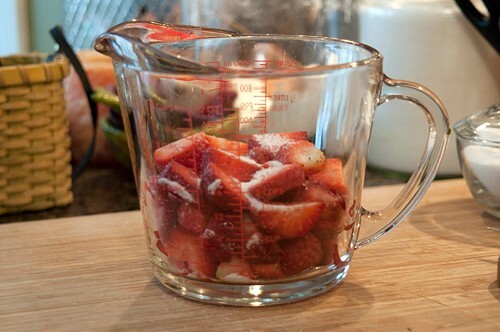 Combine the sliced fresh strawberries with one tablespoon sugar and toss gently to combine. Allow the strawberries to sit for about 15 minutes. While the strawberries sit, prepare the whipped cream. Beat the heavy cream with a whisk or an electric mixer until it reaches the soft peak stage. Add the remaining sugar and the vanilla and beat just until combined. Assemble the cake in a 9×5 loaf pan or on a platter or serving dish. Make layers in this order: Layer 1 – Place a small amount of the whipped cream on the bottom of the pan and top with three graham crackers; Top the graham crackers with the sliced banana. 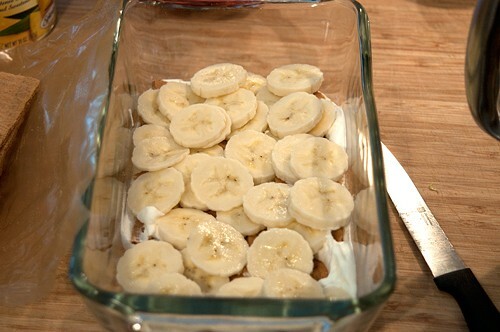 Top the bananas with 1/3 of the whipped cream. 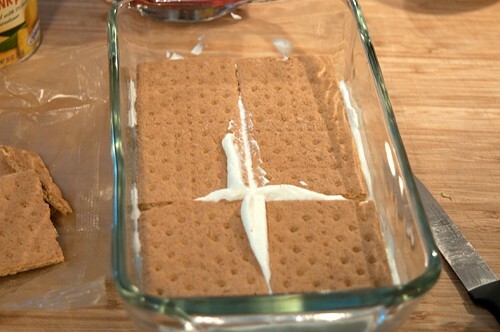 Layer 2 – Three graham crackers, the sweetened, sliced strawberries, and 1/3 of the whipped cream. Layer 3 – Three graham crackers, the lightly drained pineapple and the remaining 1/3 of the whipped cream. Cover and refrigerate for 8 hours or overnight. When ready to serve, top with the chopped salted peanuts, caramel and chocolate ice cream toppings, and maraschino cherries. 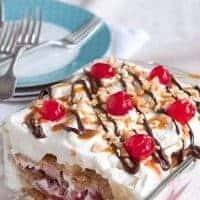 Easy no-bake icebox cake featuring everything you enjoy about a banana split! While the strawberries sit, prepare the whipped cream. Beat the heavy cream with an electric mixer until it reaches the soft peak stage. Add the remaining sugar and the vanilla and beat just until combined. Assemble the cake in a 9x5 loaf pan or on a platter or serving dish. Make layers in this order: Layer 1 - Place a small amount of the whipped cream on the bottom of the pan and top with three graham crackers; Top the graham crackers with the sliced banana. Top the bananas with 1/3 of the whipped cream. 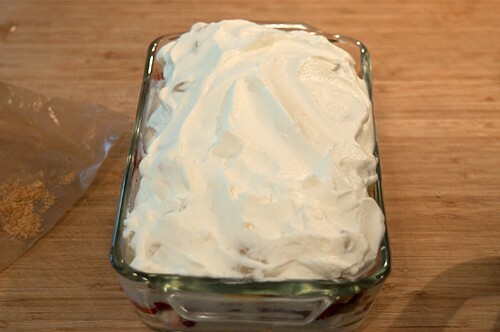 Layer 2 – Three graham crackers, the sweetened, sliced strawberries, and 1/3 of the whipped cream. Layer 3 – Three graham crackers, the lightly drained pineapple and the remaining 1/3 of the whipped cream. I haven’t made an ice box cake in years! Your banana split version looks terrific—it would be perfect for Memorial Day! It would, Liz! It’s great all year round, but particularly appropriate for that occasion. I need more ice box cakes in my life. This is gorgeous! You do, Ashley. And there are many, many types to choose from. Mmm that sounds amazing! I’ve never made an icebox cake before but they sound delicious…will have to try it! They are delicious and so very easy! I do hope you’ll give it a try, Kelly. It’s one of the easiest recipes in my collection. Gosh;, what a delicious looking dessert. Never had an Ice-box cake before. Shall make this for the family at Easter and surprise them. Hope they enjoy it, Deirdre. I have a feeling that the next time your grandkids come to visit, they are going to be begging for this cake. It looks wonderful, Lana! I think I’ll surprise them, Dara. They’re going to love it! What a delicious and easy dessert! This is one of those recipes that the entire family will love! Yes, all ages love this dessert, Martha. I mean, who doesn’t like a banana split, right? They’re a fun, old fashioned dessert, Erin. And so easy to make. No baking! This cake look like it could turn any occasion into a party. How fun and colorful. I’m loving all the delicious layers. Pinning and hope to make this one day soon. Thanks, Lana. Ice box pies were my favorite as a kid. I would always open the fridge and steal a few bites. I couldn’t resist! I love the banana split version. I’ve never made an icebox cake. This recipe makes me want to give it a go! Hope you will give it a try, Brenda. I think you’ll like it! In your icebox Banana split cake, I like it because you don’t have to use raw eggs, like in the traditional Banana split cake. Thanks for sharing!